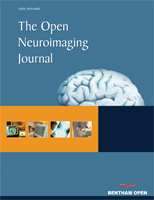 The Open Neuroimaging Journal is an Open Access online journal, which publishes original research articles, review articles, letters and guest edited single topic issues in the field of neuroimaging, aiming at providing the most complete and reliable source of information on current developments in the field. This journal publishes open access reviews on recently published books (both print and electronic) relevant to the journal. Publishers and authors of books are invited to contact our book reviews editor at tonij@benthamopen.net with book review requests. All submitted books will be reviewed by an independent expert in the field. No page charges will be levied to authors for the publication of book reviews. Greek symbols and special characters often undergo formatting changes and get corrupted or lost during preparation of manuscript for publication. To ensure that all special characters used are embedded in the text these special characters should be inserted as a symbol but should not be a result of any format styling (Symbol font face) otherwise they will be lost during conversion to PDF/XML. Issa F, Gerhardt GA, Bartko JJ, et al. A multidimensional approach to analysis of cerebrospinal fluid biogenic amines in schizophrenia: I. Comparisons with healthy control subjects and neuroleptic-treated/unmedicated pairs analyses. Psychiatry Res 1994; 52: 237-9. Brasil-Neto J, Cohen LG, Panizza M, Fuhr P, Hallett M. Optimal focal transcranial magnetic activation of the human motor cortex: effect of coil orientation, shape of induced current pulse, and stimulus intensity. J Clin Neurophysiol 1998; 9:132-6. Buchsbaum MS, Holcomb HH, DeLisi LE, Hazlett E. In: Rush AJ, Altshuler KZ Eds. Brain imaging in affective disorders., Depression: Basic Mechanisms, Diagnosis and Treatment. New York, The Guilford Press, 1986; 126-42. Strunk W, White EB. The elements of style, 3rd ed. New York: MacMillan, 1979. Pagedas AC, inventor; Ancel Surgical R&D Inc., assignee. Flexible endoscopic grasping and cutting device and positioning tool assembly. United States patent US 20020103498. August, 2002. Citations for articles/material published exclusively online or in open access (free-to-view), must contain the exact Web addresses (URLs) at the end of the reference(s), except those posted on an author’s Website unless editorially essential, e.g. ‘Reference: Available from: URL’. All authors must strictly follow the guidelines below for preparing illustrations for publication in The Open Neuroimaging Journal. If the figures are found to be sub-standard, then the manuscripts will be rejected. The open access fee for a published book review is US $450.